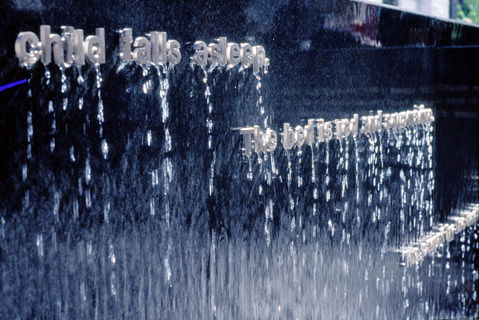 “In my work, I have often combined text with sculptural forms, but I have always wanted the integration between sculpture and text to be less a surface applied event than one in which the words and their meaning correspond to the space and one’s movement through it…The sculpture will focus on the idea of reading. As you walk through the garden, words will be placed that will allow for a “reading” of the space. But it is the “word map” of the garden that I find particularly intriguing, the language structure provided by her brother. 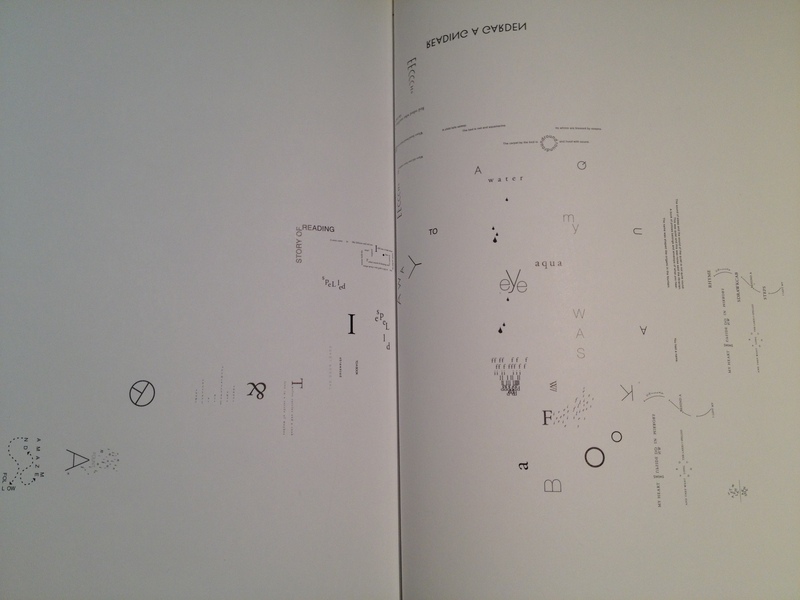 You must find your own copy of the book to appreciate this poem that became a physical thing. Or wander through the library’s garden the next time you’re in Cleveland. 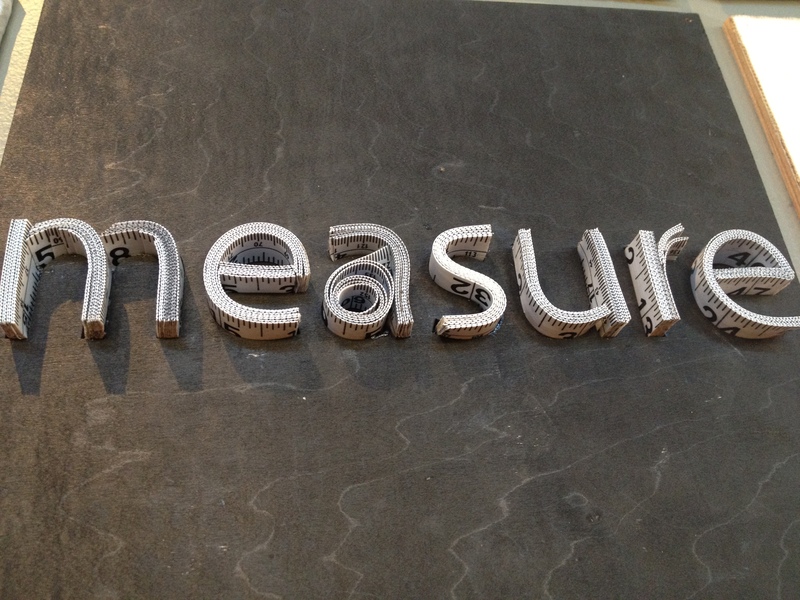 I understand a giant reading nest was recently installed, the process documented at LAND Studio’s Website. 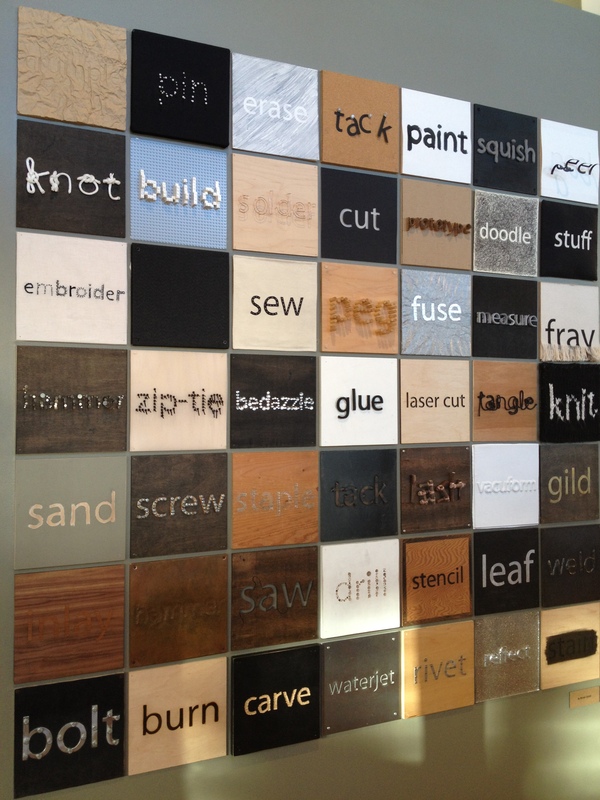 The entrance to the Tinkering Studio at the Exploratorium in San Francisco is a testament to materials and how they’re used, a great place to take kids for a little tactile play. Just down the street from Dogpatch, near the entrance to the UCSF Orthopaedic Institute in San Francisco, sits a word person, clasping knees to chest. I’m thinking it’s a commentary on all the “text” that now “overflows” our lives. Soon we will become nothing but piles of letters, scattered thoughts. OR, it could be a commentary on how words define humanity. You be the interpreter. My question: Have you run into language in unexpected places in your local landscape? 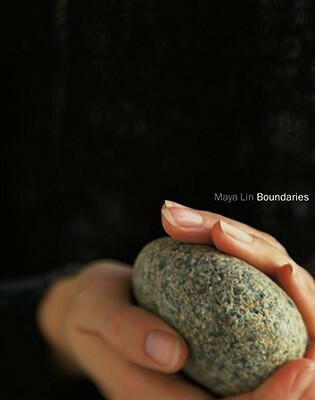 Oh, and if you’re interested in seeing more of Maya Lin’s exquisite work, take a look at her tonal Website. Here’s a link to a temporary installation called “Winged Wisdom” from 2010 located in the Presidio, another corner of San Francisco. I love artists who can pull things like this together — true talent. I would love to see these sculptures in person, but I will have to settle for images closer to home. I do live in an “artsy” area, but I haven’t run into anything so provocative as what you talk about here. Yes, opposable thumbs help us text faster, but I think linguists would agree with you about the second interpretation. Oh, please go–even if you have to go by yourself. Maybe if you show them some of the photos from the Cleveland Library website, they’ll be intrigued. Let me know if you’re successful. Cleveland is now on my list of places to visit because of you. This park and book look so beautiful. 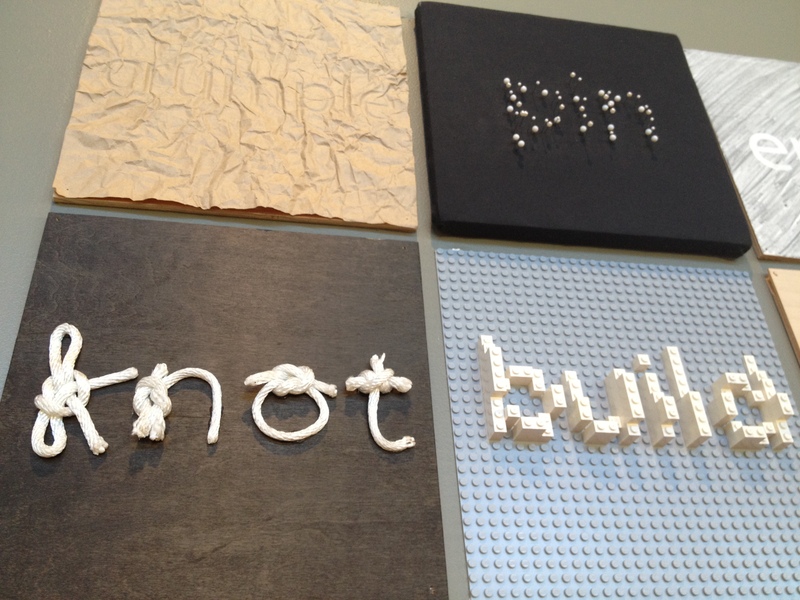 I love the idea of words and sculpture defining space. Not so much for my own garden but in a public space, to make one stop, take the time to take in one’s surroundings. 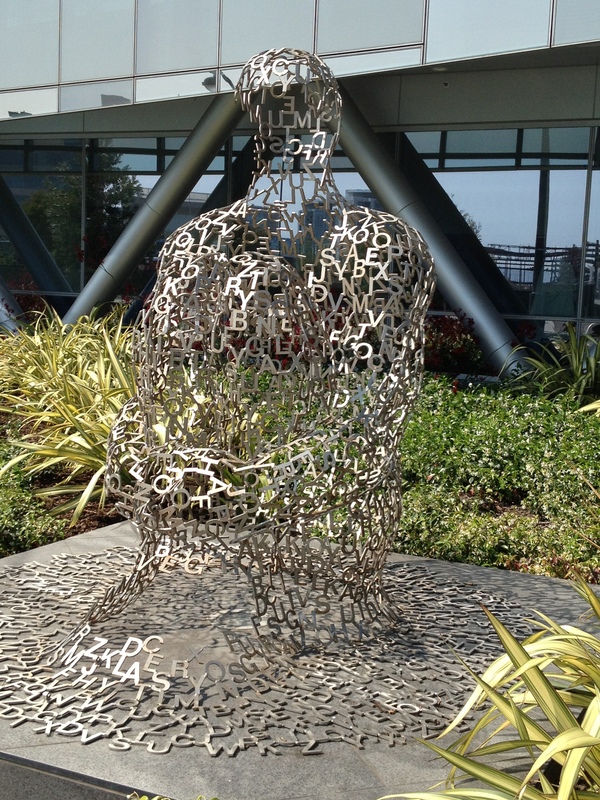 There was a temporary word sculpture outside our local library that read “listen”. I noticed that people would always slow down when walking by it (or was that my imagination?). I will be buying this book – thank you for bringing it to my attention, Jilanne. Oh, I love it! “Listen” Yes, taking a moment to pause and consider one’s surroundings instead of bustling through every minute of the day unawares. And I’m pleased that you will be taking a longer look at her work. She is such a talented artist. Thanks again for the Tweet! Fantastic. And you give me yet another reason to visit SF. The first reason being to engage my son in comic book drawing contest? That should go wtihout saying. I love the Overflow one and your interpretation of it is perfect. I’m familiar with those very scattered thoughts. Hopefully somehow all those scattered thoughts will make up a coherent person. I haven’t noticed art like that around here but now I’ll be on the lookout for it! If you find something, take a pic and post it on your blog. I’d love to see it!